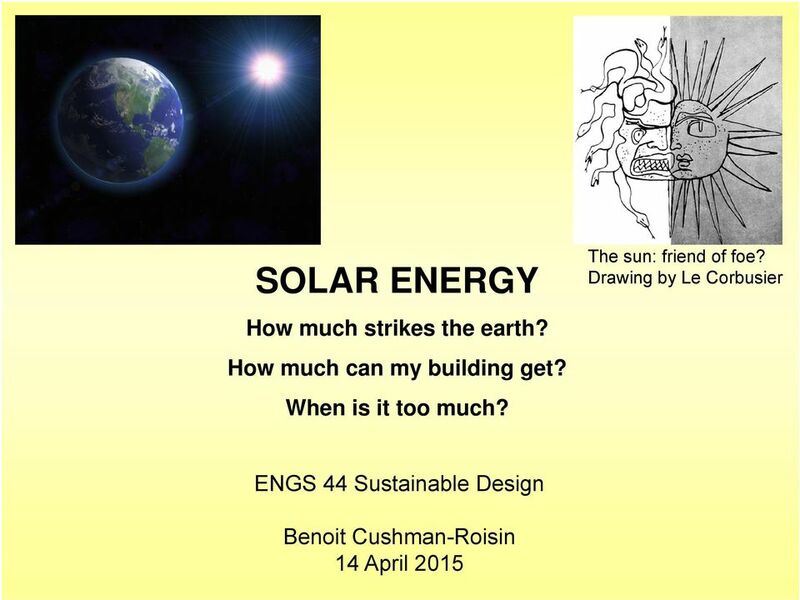 Download "SOLAR ENERGY How much strikes the earth? How much can my building get? When is it too much?" 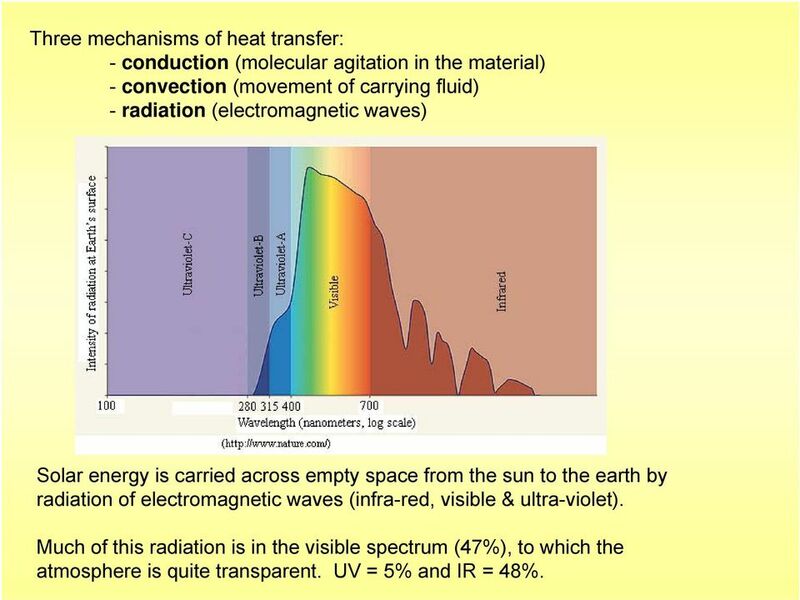 3 Three mechanisms of heat transfer: - conduction (molecular agitation in the material) - convection (movement of carrying fluid) - radiation (electromagnetic waves) Solar energy is carried across empty space from the sun to the earth by radiation of electromagnetic waves (infra-red, visible & ultra-violet). Much of this radiation is in the visible spectrum (47%), to which the atmosphere is quite transparent. UV = 5% and IR = 48%. 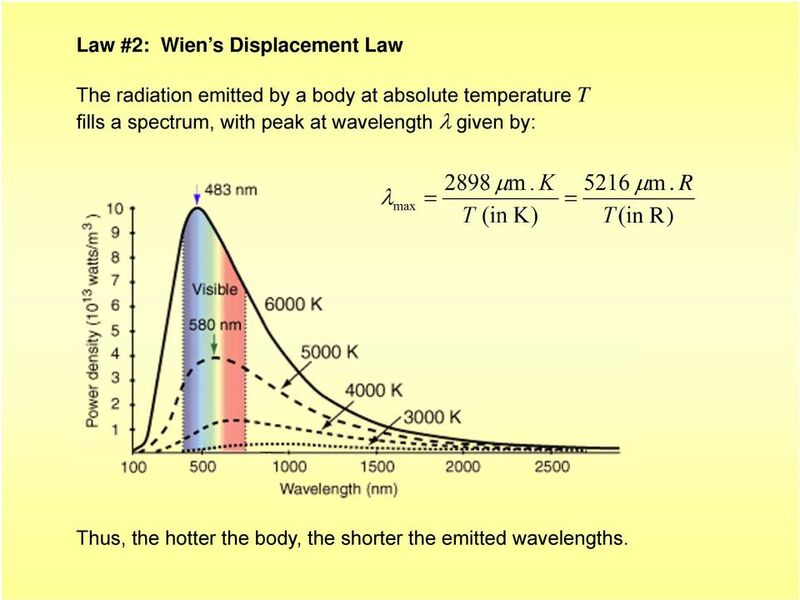 5 Law #2: Wien s Displacement Law The radiation emitted by a body at absolute temperature T fills a spectrum, with peak at wavelength given by: max 2898 m. K T (in K) 5216 m. R T (in R) Thus, the hotter the body, the shorter the emitted wavelengths. 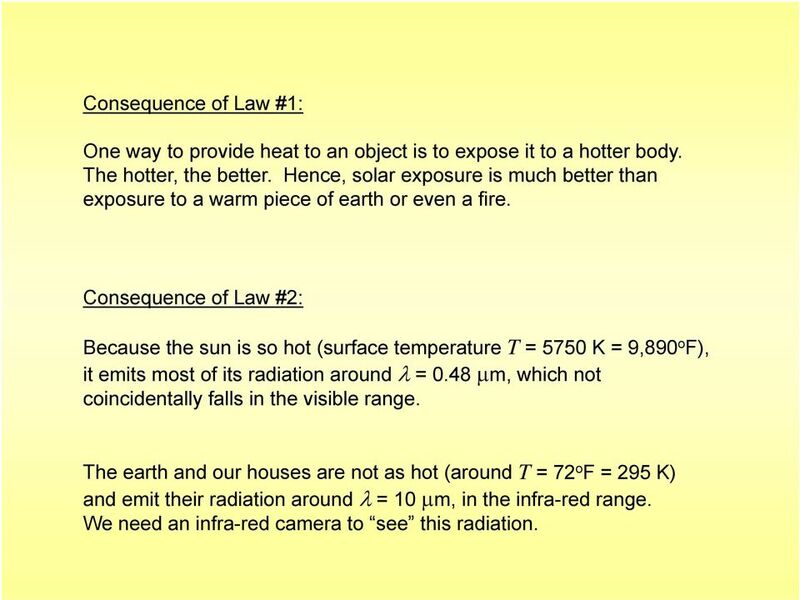 6 Consequence of Law #1: One way to provide heat to an object is to expose it to a hotter body. The hotter, the better. 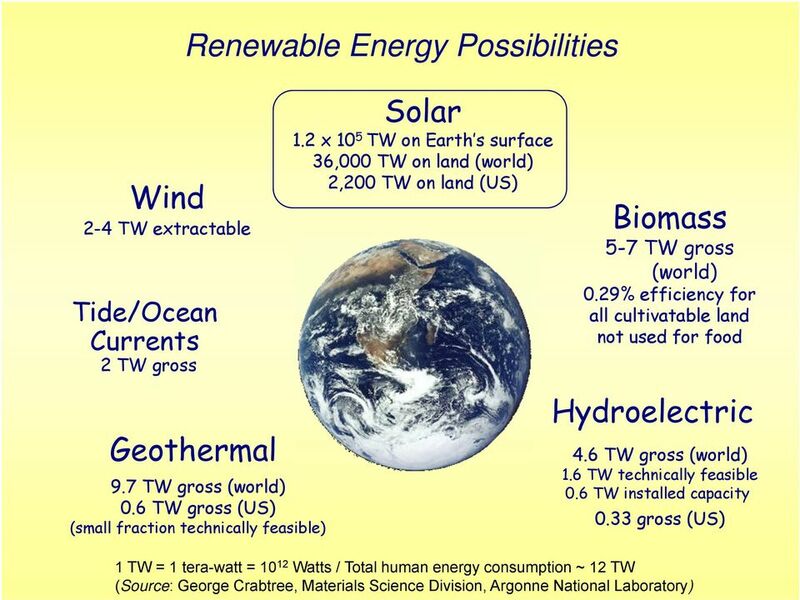 Hence, solar exposure is much better than exposure to a warm piece of earth or even a fire. 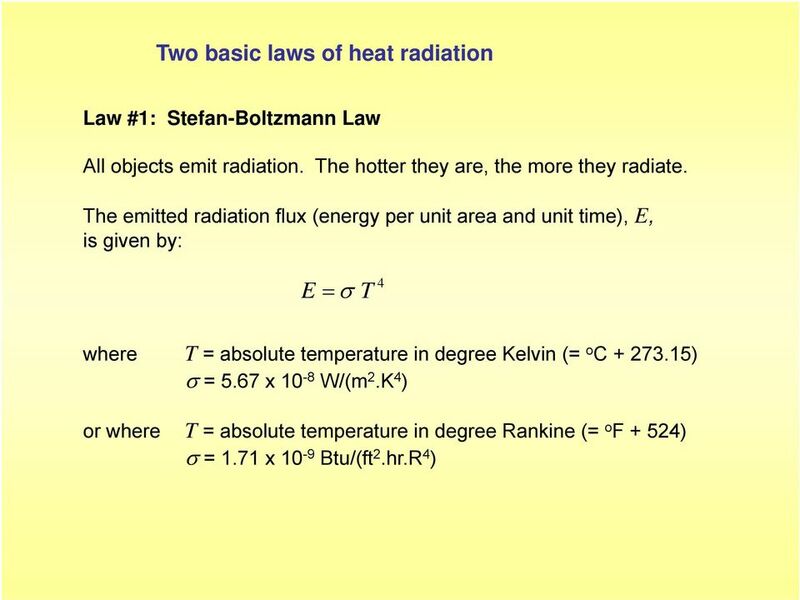 Consequence of Law #2: Because the sun is so hot (surface temperature T = 5750 K = 9,890 o F), it emits most of its radiation around = 0.48 m, which not coincidentally falls in the visible range. The earth and our houses are not as hot (around T = 72 o F = 295 K) and emit their radiation around = 10 m, in the infra-red range. We need an infra-red camera to see this radiation. 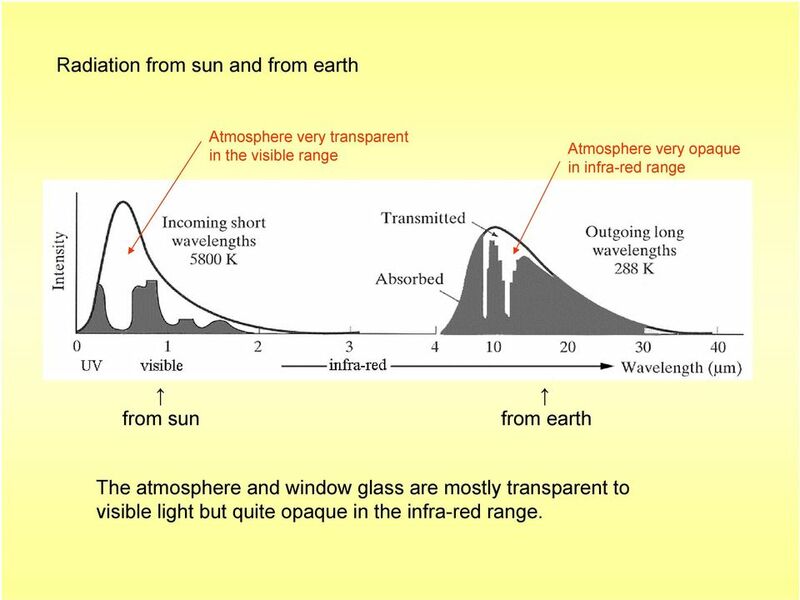 7 Radiation from sun and from earth Atmosphere very transparent in the visible range Atmosphere very opaque in infra-red range from sun from earth The atmosphere and window glass are mostly transparent to visible light but quite opaque in the infra-red range. 8 From sun to earth: Being at 5750 K, the sun emits 6.2 x 10 7 W/m 2. 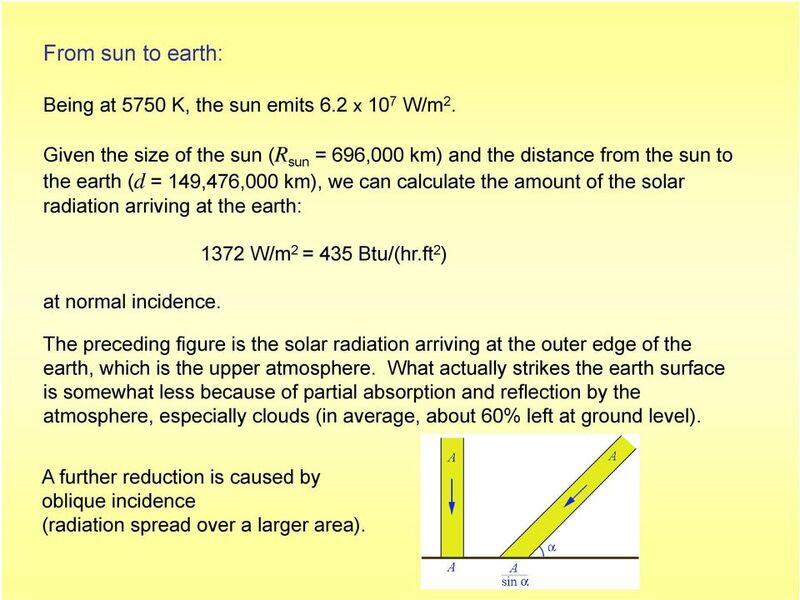 Given the size of the sun (R sun = 696,000 km) and the distance from the sun to the earth (d = 149,476,000 km), we can calculate the amount of the solar radiation arriving at the earth: at normal incidence W/m 2 = 435 Btu/(hr.ft 2 ) The preceding figure is the solar radiation arriving at the outer edge of the earth, which is the upper atmosphere. What actually strikes the earth surface is somewhat less because of partial absorption and reflection by the atmosphere, especially clouds (in average, about 60% left at ground level). A further reduction is caused by oblique incidence (radiation spread over a larger area). 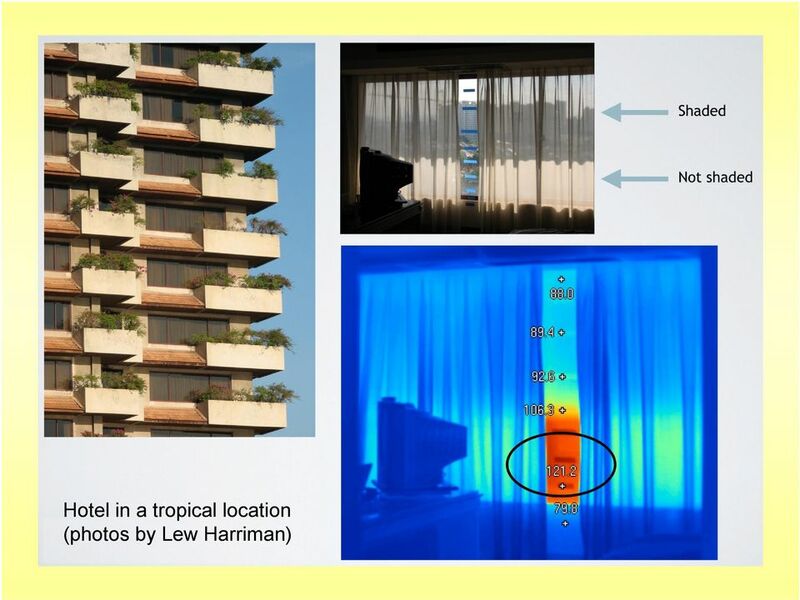 11 ( apartment/source/4.html) Overhang lengths and room depths can be calculated to adjust for this seasonal effect. 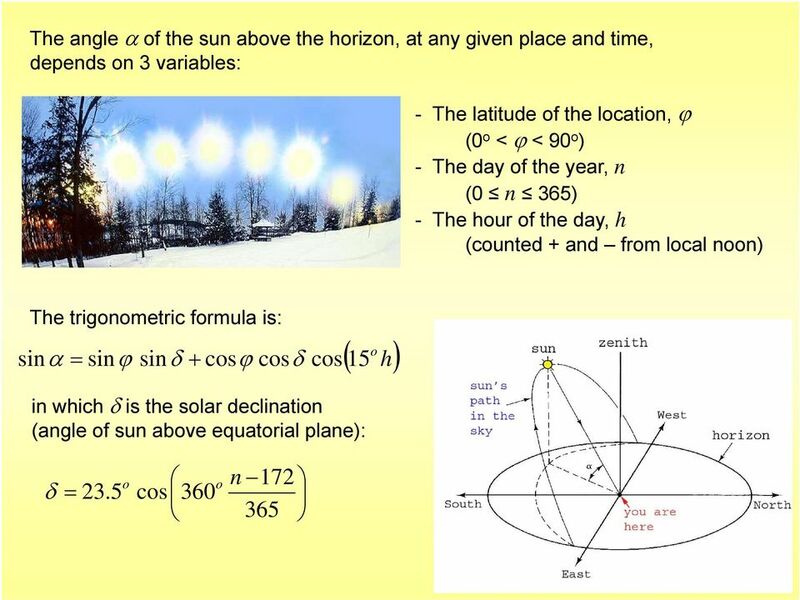 Usually, we need to - maximize the uptake of winter sun and - eliminate the uptake of summer sun. 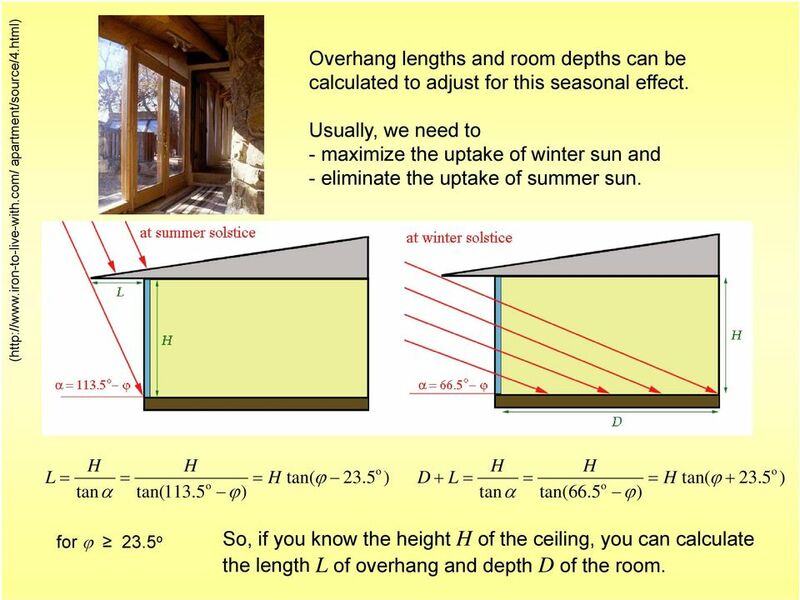 L H tan H tan(113.5 o ) H tan( 23.5 o ) D L H tan H tan(66.5 o ) H tan( 23.5 o ) for 23.5 o So, if you know the height H of the ceiling, you can calculate the length L of overhang and depth D of the room. 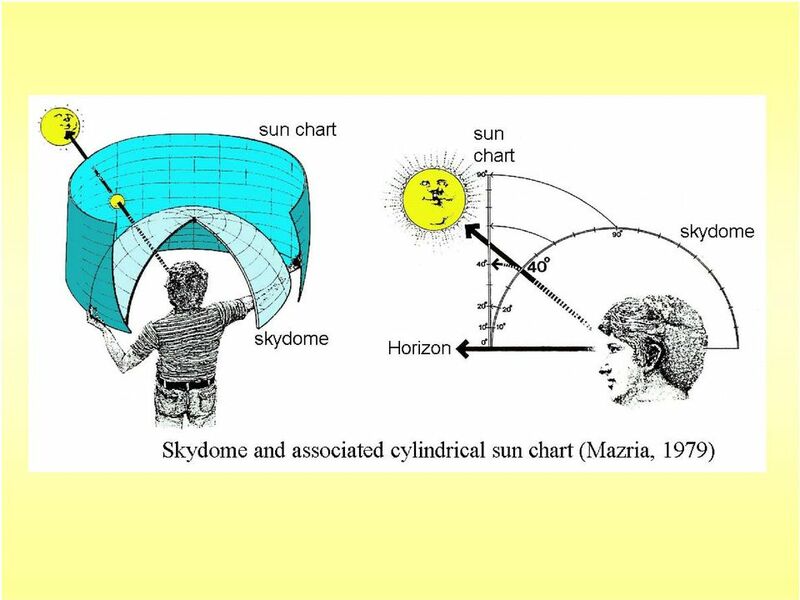 17 The sun does not just move up and down in the sky, it also moves across the sky, rising in the East and setting in the West and occasionally not setting at all. 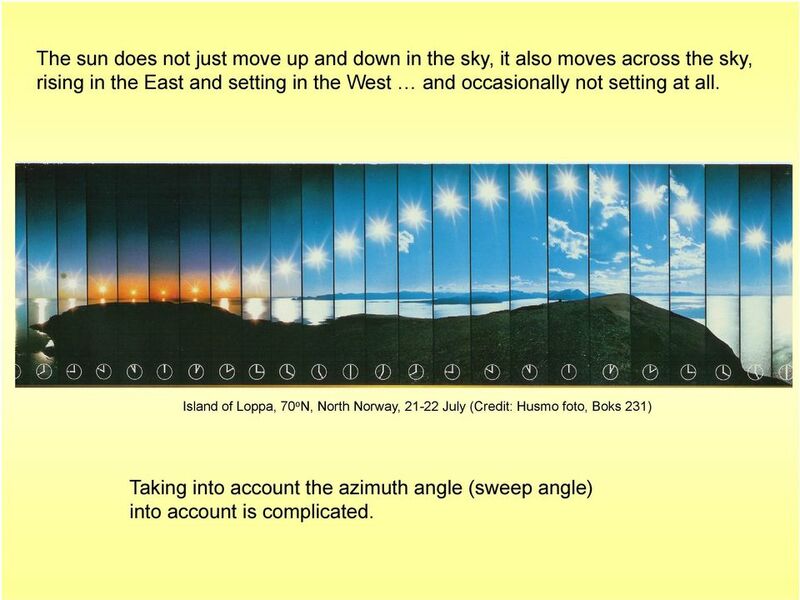 Island of Loppa, 70 o N, North Norway, July (Credit: Husmo foto, Boks 231) Taking into account the azimuth angle (sweep angle) into account is complicated. 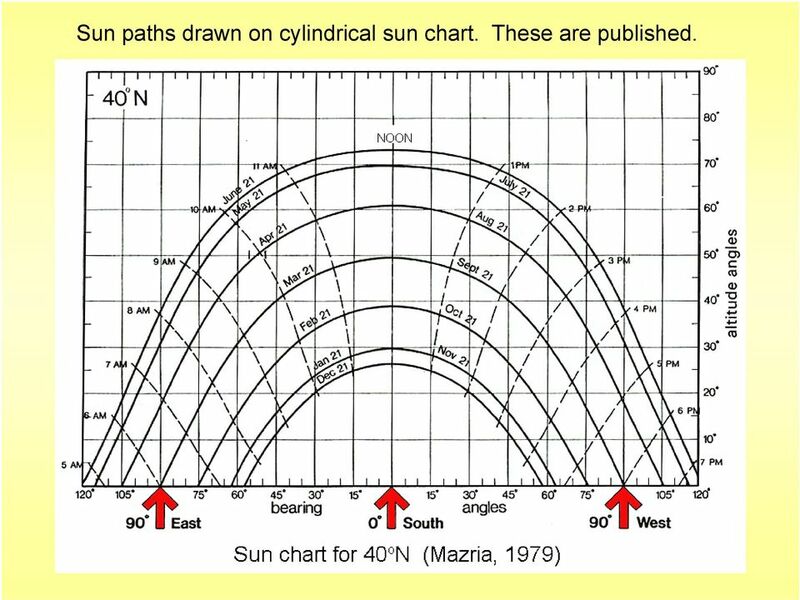 20 Sun paths drawn on cylindrical sun chart. These are published. 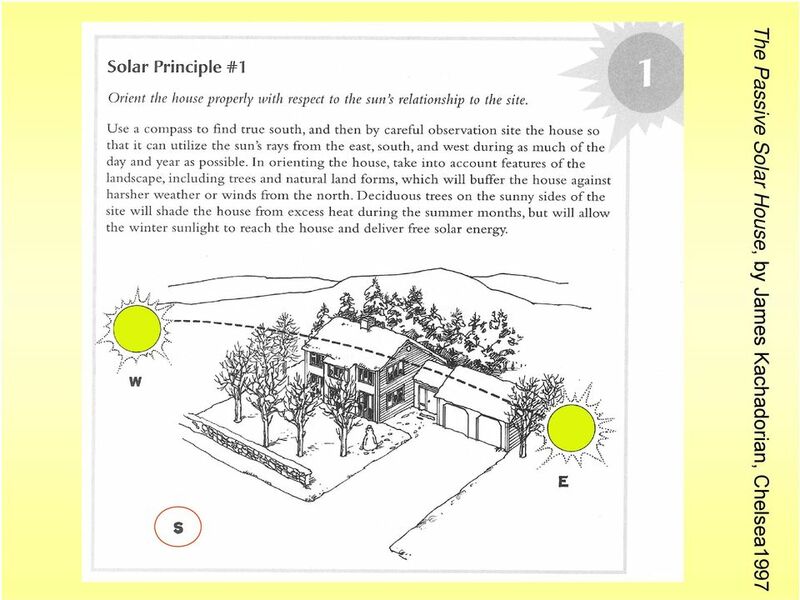 23 For a first estimate (not adjusting for vegetation), one simply distinguishes between east, south, west and north facing walls of the structure, and use a so-called Solar Heat Gain Factor (SHGF) for each side. For 40 o N, SHGF values (in BTUs per ft 2 per day, for average cloudiness in the USA): In practice, use local cloudiness factor Month # days East South West North % sun January , % February , % March , % April % May 31 1, , % June 30 1, , % July 31 1, , % August % September , % October , % November , % December , % Then apply a Shade Coefficient (multiply by 0.87) to account for partial reflection by glass if sunlight is captured inside of a window. 26 A well functioning building needs to perform the following three functions simultaneously: 1. 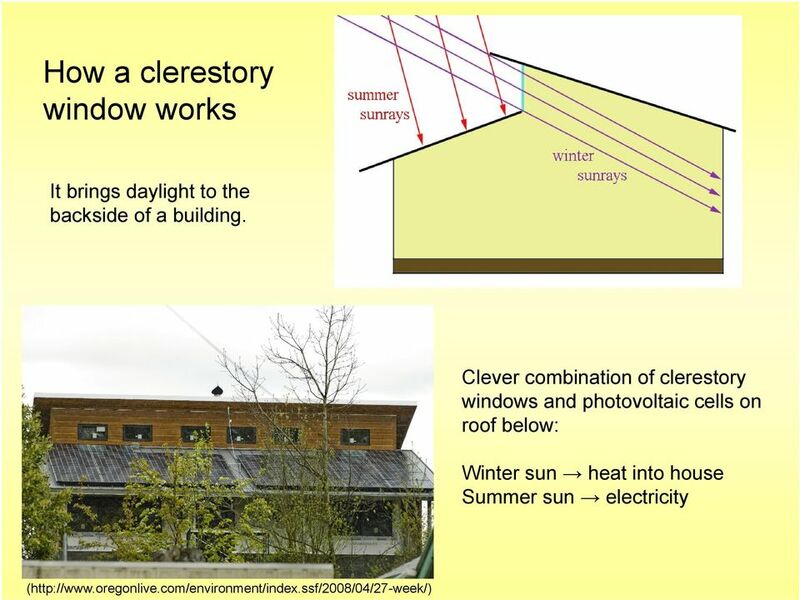 Capture the necessary solar energy - Enough in winter - Not too much in summer 2. Store heat during day for delayed use through the night, 3. Distribute the heat effectively through the various rooms. 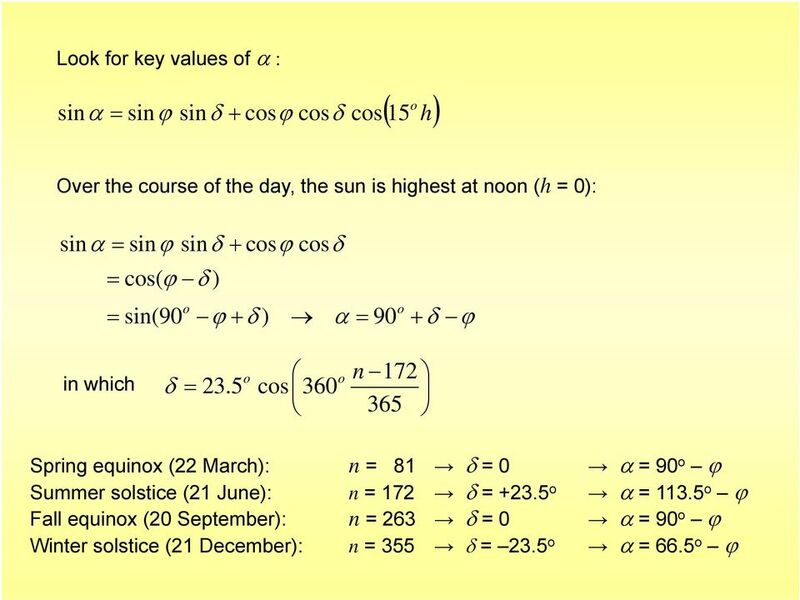 The set of these three functions is called Direct Solar Gain. The preceding slides dealt with 1. The next couple of slides give an advanced glimpse of 2. and 3. DEPLOSUN REFLECTORS. Carrer dels Vergós, 11 08017 Barcelona Spain Tel: (+34) 934.090.359 Fx: (+34) 934.090.358 info@espaciosolar. 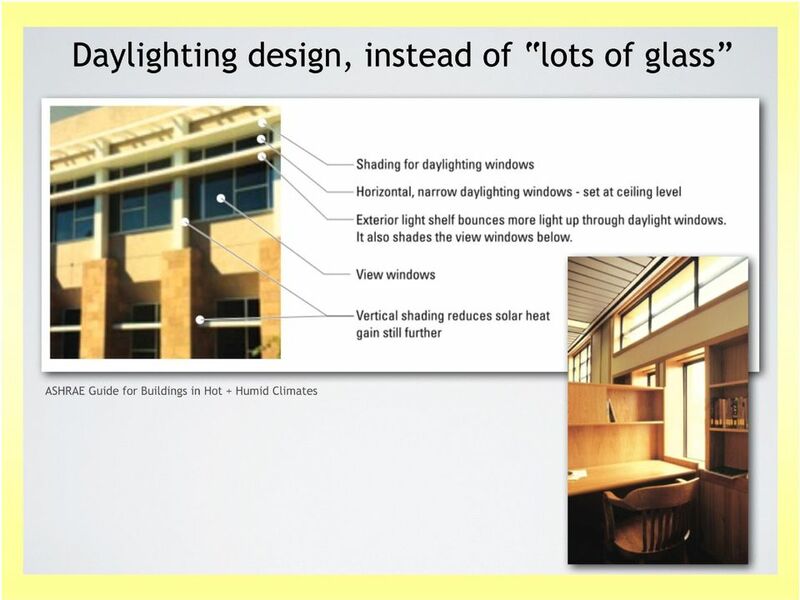 THE NATIONAL BUILDING REGULATIONS PART XA: ENERGY EFFICIENCY. Presentation by Peter Henshall-Howard: HEAD: BUILDING DEVELOPMENT MANAGEMENT. Selecting Energy Efficient New Windows in Georgia www.efficientwindows.org January 016 ENERGY STAR Zones 1. 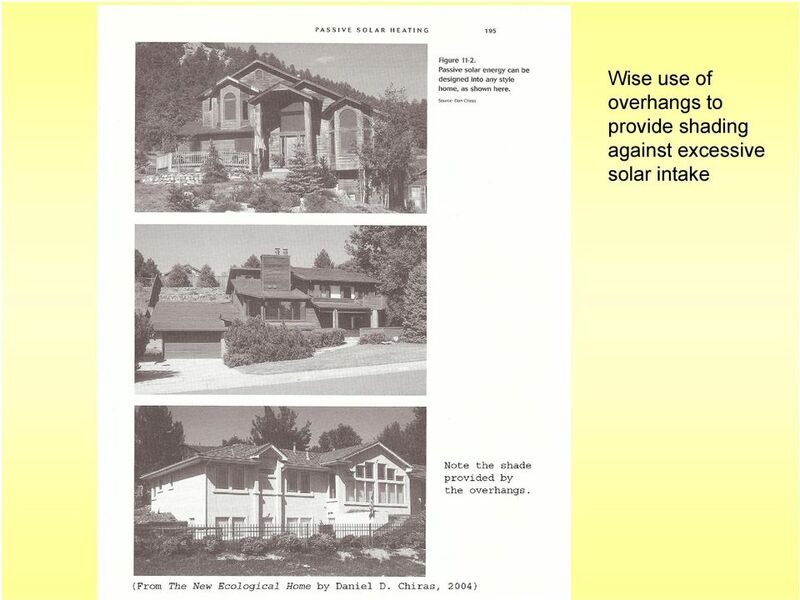 Meet the Energy Code & Look for the ENERGY STAR Windows must comply with your local energy code. Selecting Energy Efficient New Windows in Arizona www.efficientwindows.org January 016 ENERGY STAR Zones 1. 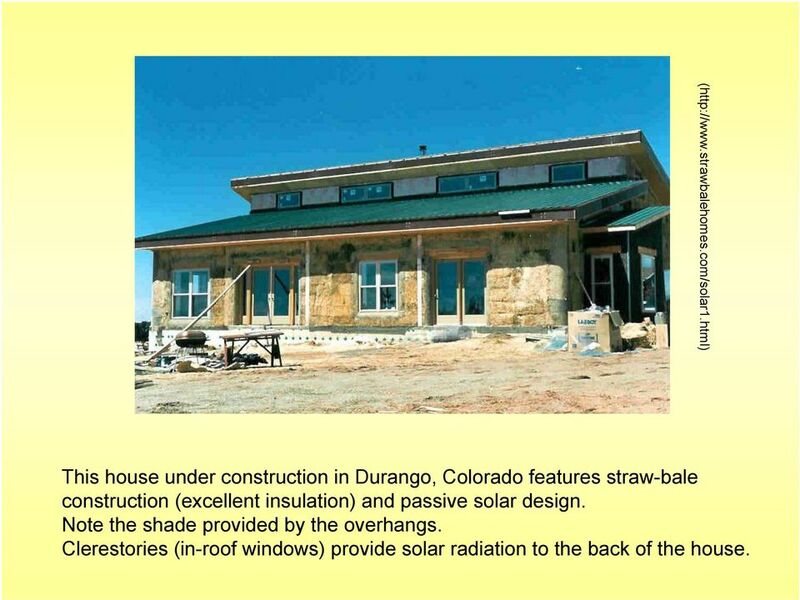 Meet the Energy Code & Look for the ENERGY STAR Windows must comply with your local energy code.